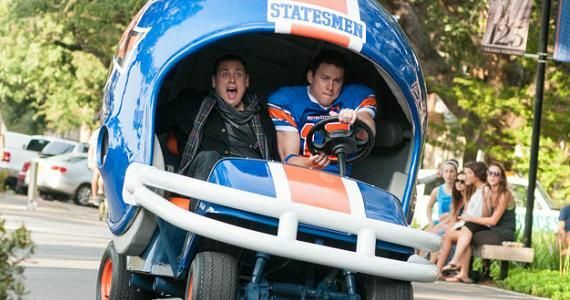 Here we have it, the final red band trailer for 22 Jump Street, the hugely anticipated follow-up to the brilliant surprise hit 21 Jump Street. Jenko and Schmidt (Channing Tatum and Jonah Hill) are back with a familiar case – infiltrating a group to find a drug dealer. But they’re not in high school anymore because, as Ice Cube’s Captain Dickson tells Jenko, ‘you look about 50’. So instead, they head to university – which is at least slightly closer to their own ages! We get a better sense of the plot from this latest trailer – yes, it’s pretty similar to the first film, but we see them enjoying spring break and meet the movie’s villain in the shape of Peter Stormare as Big Meat. We see Schmidt and Jenko in couple’s counselling, and again we see familiar faces from the first film – Mr Walters and Eric (Rob Riggle and Dave Franco), both now in prison. Even from the trailer, it’s clear that directors Chris Miller & Phil Lord know the dangers of increased expectation, and the sequel law of diminishing returns – Schmidt tries to convince Captain Dickson (and the audience) that the case isn’t the same, and it’s these moments that will alleviate any pressure on the film. The knowing references, and the fact Miller & Lord (still riding high from the huge success of The LEGO Movie) are returning to direct, will fill people with great hope that this can be every bit as good as the first film. It looks like we’re going to see a whole lot of rips of the college movie genre, Spring Breakers references, and the bromance between Jenko and Schmidt continuing. This one’s going to be good. 22 Jump Street is released in the UK & US on 13 June 2014.